Zion Market Research has published a new report titled “Glyphosate Market for Conventional Crops and Genetically Modified Crop Applications: Global Industry Perspective, Comprehensive Analysis, and Forecast, 2017 – 2024.” According to the report, global glyphosate market was valued at USD 7.24 billion in 2017 and is expected to reach USD 10.88 billion in 2024, growing at a CAGR of 6.2% between 2018 and 2024. In terms of volume, the global glyphosate market stood at approximately 785.30 kilotons in 2017. The Asia Pacific was the foremost market for glyphosate in 2017. It accounted for above 30% share of the total market in 2017. Furthermore, it is anticipated to exhibit great potential to surge the demand for glyphosate due to the growing adoption of genetically modified crops in the region. 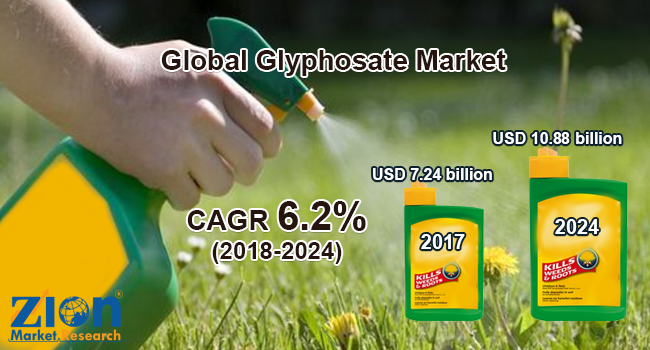 Moreover, Asia Pacific is the fastest growing market of glyphosate within the forecast period as it is farming based region and there is the abundant availability of arable land. Furthermore, the increasing penetration of modern farming is expected to influence the growth of the genetically modified crops in the region, which in turn is likely to have a positive impact on the demand for glyphosate in the region. The Asia Pacific was followed by North America and Europe and it is predicted to witness a significant growth in the near future. Latin America is also expected to reveal great opportunities for the market of glyphosate over the forthcoming years.